IT governance in public universities is yet to be fully appreciated. This is because IT governance is just evolving as a new paradigm to take care of the stakeholders’ expectations in leveraging IT with business goals. 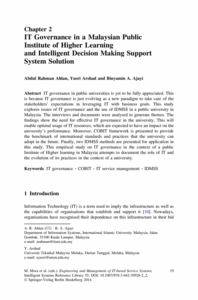 This study explores issues of IT governance and the use of IDMSS in a public university in Malaysia. The interviews and documents were analysed to generate themes. The findings show the need for effective IT governance in the university. This will enable optimal usage of IT resources, which are expected to have an impact on the university’s performance. Moreover, COBIT framework is presented to provide the benchmark of international standards and practices that the university can adopt in the future. Finally, two IDMSS methods are presented for application in this study. 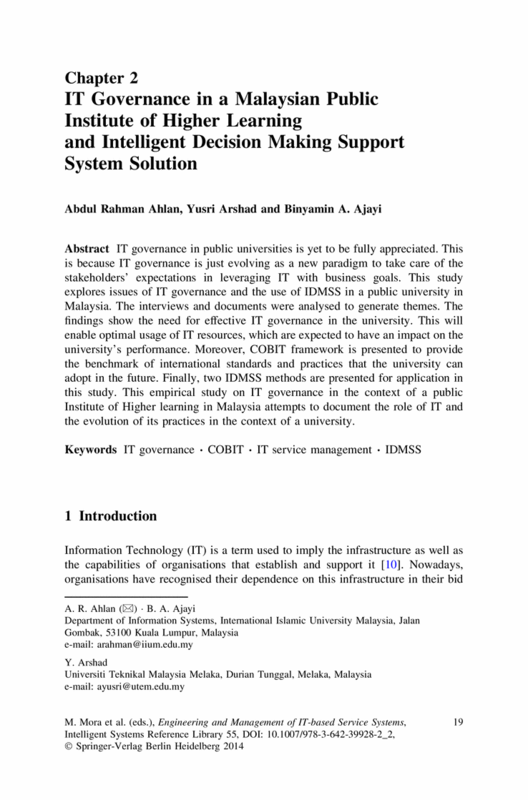 This empirical study on IT governance in the context of a public Institute of Higher learning in Malaysia attempts to document the role of IT and the evolution of its practices in the context of a university.